Sooner or later, if you potter about the elderly houses and castles of old England, particularly in the north, you’ll come across Lady Anne Clifford – though hopefully only by reputation, because she died more than 300 years ago. 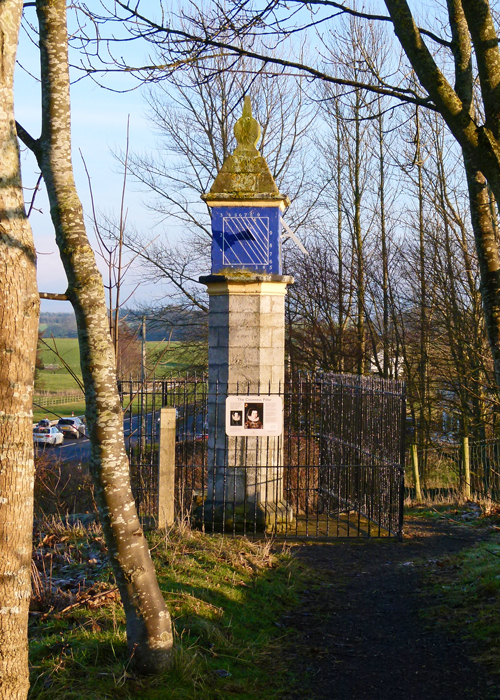 A couple of miles from the Cumbrian market town of Penrith, on the south side of the A66 – if you ever plan to motor east, you’ll see – the Countess Pillar. It’s easy to miss. 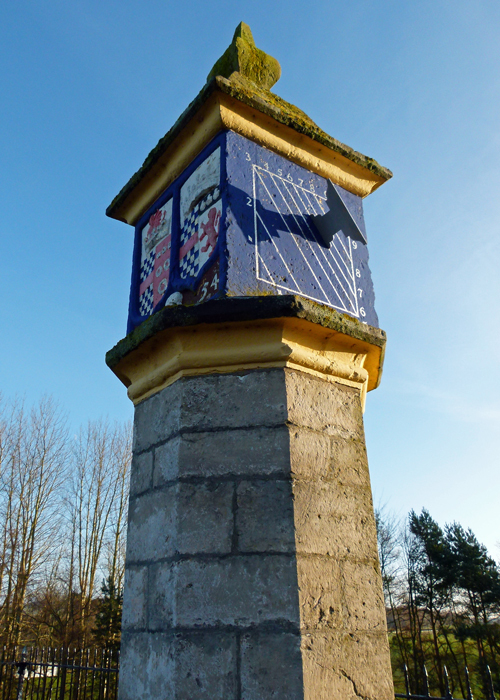 Look for the junction with the B6262, park up, and walk a few hundred yards east, parallel with the A66. You’ll find the pillar kept in a small cage at the end of a path. 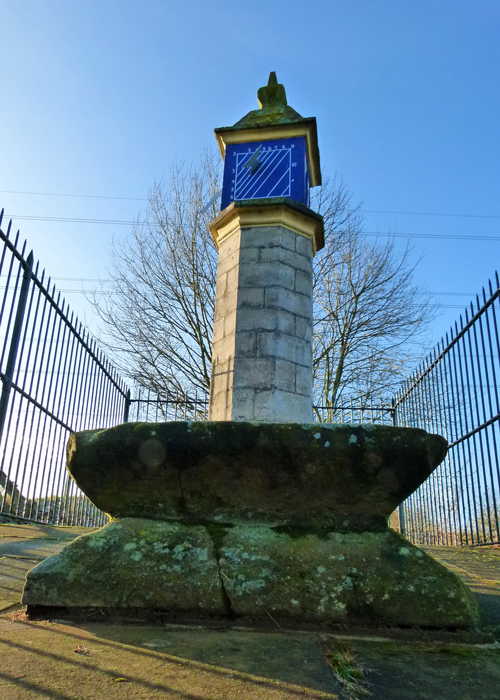 It was erected by Lady Anne in 1656 to commemorate the last time she and her mother said goodbye, 40 years previously. It stands near the spot, as Lady Anne wrote, “Where she and I had a grievous and heavy parting,” at the junction of the old driveway to Brougham Castle and the main road. Anne had been visiting and was setting off on the long journey back south to Knole House, her enormous home in Kent; her mother, Margaret, was returning to Brougham, which had been owned by the family since the 13th century and where, a month later, she died. So what’s with the pillar? The de Cliffords were one of the big landowning dynasties of medieval England. They arrived from Normandy in the 11th century and went on to hold great offices of state, as well as fighting – and often dying – in most of England’s wars at home and abroad. Anne was born at one of the family castles, Skipton, probably on 30th January 1590. The family was obviously well-connected and, thanks to her mother, Anne was brought up to be educated and sophisticated. As a girl, she was a favourite of Queen Elizabeth I; as a young woman, she danced with the Queen, Anne of Denmark – who advised her (with some justification) not to trust her husband, King James I (VI of Scotland). Anne’s father, George Clifford, Earl of Cumberland, was a champion jouster and buccaneer – what the Spanish might have called ‘a pirate’. He died in 1605 and, rather than leaving his estates to his one surviving child, Anne, he instead left them to his brother, Francis. Anne was outraged, both by the injustice and by being disinherited. However, this young lady was not only highly intelligent; she was also extremely determined and was not going to be pushed around. So, though only 15, with the help of her mother Anne Clifford set out to win her birthright, and embarked upon a legal battle that would consume the next 38 years of her life. Eventually, in 1643, Anne was successful – because she outlived her uncle and cousin and the properties finally passed to her. Unfortunately, a bloody civil war was raging in England at the time and it was not safe to leave the security of Baynard Castle, in London, where she was staying. So it was not until 1649, by which time she was 60 years old, that Lady Anne was able to head north and physically reclaim her heritage. She found her estates neglected, with many of the properties ruined or decayed. With the same dogged resolution that she had displayed all of her life she set about repairing her family’s heirlooms. This included restoring the castles at Appleby, Brough, Brougham, Pendragon and Skipton; she also built and restored churches and almshouses. And that’s how she spent the next 26 years or so, journeying between her properties in the manner of a benevolent medieval matriarch until her death in 1676, at the age of 86, in the same room at Brougham Castle where her father had been born and her beloved mother had died. In many ways, Lady Anne Clifford is defined by her long legal battle and subsequent restoration work. Yet, along the way, she was eyewitness to great historical events, married twice and had children. She also kept a diary, providing a fascinating insight to her life and times. Her first husband, in 1609, was Richard Sackville, Earl of Dorset – a notorious wastrel and spendthrift, with whom she had three sons who died in childhood and two surviving daughters. Sackville died in 1624 and, six years later, Anne married Philip Herbert, Earl of Pembroke and Montgomery, a widower with several children and with whom she had two premature boys who did not survive. Neither marriage was happy and it seems that the constants in Anne’s life were her mother, her sense of justice and her family heritage. Some might see Lady Anne Clifford as a champion of women at a time when it was very much a man’s world – though that is to commit the sin of viewing history solely through the lens of the present. That she was an extraordinary woman is not in doubt. She also, apparently, smoked a pipe. I get the impression that as well as being a character, Anne was quite a loner. In any event, here we have this 14 foot high octagonal Countess Pillar, dedicated to the mother she loved, and who was the only person to stand by her, the only person she could totally depend on – until she died in 1616. It must have been quite a relationship, and quite a loss. Perhaps, also, the Countess Pillar was a public statement of Anne’s determination and ultimate success – a kind of ‘Yah-Boo’ to society. 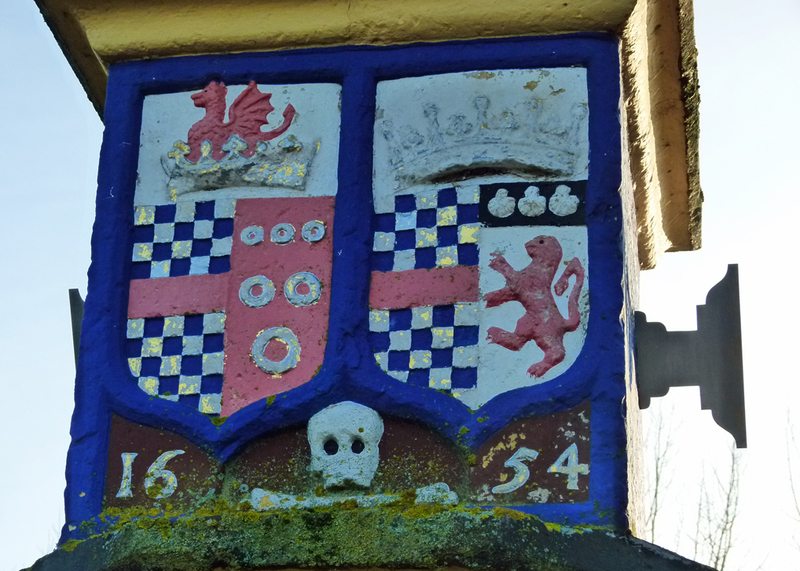 On one side of the pillar are the coats of arms of the Cliffords and the Russells (her mother’s family), next to each other. 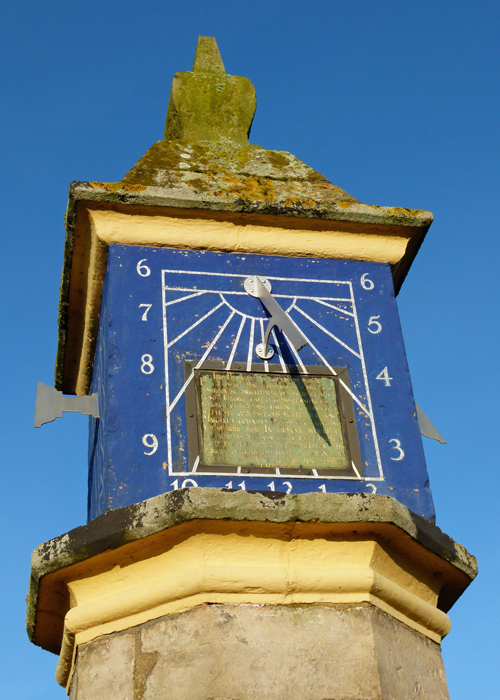 Sundials are on the other three sides. At the foot of the Countess Pillar is the dolestone, a slab of stone on which alms were distributed to the poor on the anniversary of Anne and Margaret’s final farewell. Unfortunately, we timed our visit to this historic monument badly, so missed out on the alms. We did see people walking some alpacas along the path, though, which made a nice change from sheep. THIS PILLAR WAS ERECTED ANNO 1656 BY Ye Rt HONOble ANNE COUNTESS DOWAGER OF PEMBROKE & DAUGHTER & SOLE HEIRE OF Ye Rt HONOble GEORGE EARL OF CUMBERLAND & FOR A MEMORIAL OF HER LAST PARTING IN THIS PLACE WITH HER GOOD & PIOUS MOTHER Ye Rt HONOble MARGARET COUNTESS DOWAGER OF CUMBERLAND Ye 2d OF APRIL 1616. IN MEMORY WHEREOF SHE ALSO LEFT AN ANNUITY OF FOUR POUNDS TO BE DISTRIBUTED TO Ye POOR WITHIN THIS PARRISH OF BROUGHAM EVERY 2d DAY OF APRIL FOR EVER UPON Ye STONE TABLE HERE HARD BY. I hope you noticed the 17th century cross head screws used to fix the dedication plate. “The Diaries of Anne Clifford” edited by David J H Clifford have been published and there is also a biography of Lady Anne Clifford, “Proud Northern Lady” by Martin Holmes – neither of which I have read. Links to purchase both items from Amazon are below. Anne is buried next to her mother, in Appleby church. Another amazing account, my friend. I marvel at the amount of money she must have spent fighting that protracted legal battle and restoring her properties. She obviously had some very wealthy benefactors. A great piece of history about that ‘Proud Northern Lady’. Anne Clifford certainly sounds a determined and resourceful woman. All that restoration work must have cost her a pretty penny, too. I’ll remember to take a look at this pillar when we eventually get up to Brougham Castle, Thanks so much for sharing. I love you snippets of history. Ann surely was ahead of her times and a clever lady. I’ve passed that a few times but never stopped. Nice to know what it stands for now. A grievous and heavy parting- quite a turn of phrase! Remarkable woman indeed! Imagine the determination – I can’t even begin to conceive of what I could accomplish if I had half of what she possessed. Very interesting post Mike, and seeing your reply above, I’m so pleased that English Heritage look after this. At first I thought this was going to be a post about a Spanish countess. Well anyway, I had no idea that Lady Anne Clifford was married to James I. Really?? 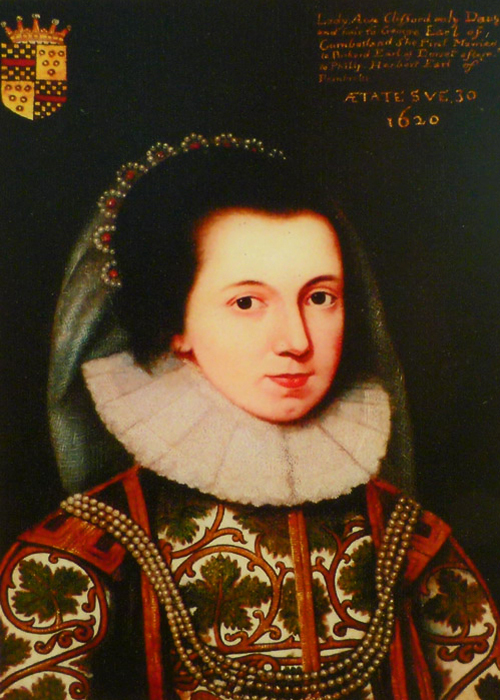 And we did first encounter Lady Anne Clifford at Skipton Castle when we visited, so I must have read that there. How could I forget something that important. So much information, Mike, so interestingly relayed to your readers! You might be relieved to know that i finally got that straightened out. Sorry. Marvelous place with magnificent sharing!!! i will be back to finish the post . What an interesting woman. I wonder if the poem, ‘The Countess of Pembroke’s Arcadia’ was about her. What an incredible lady. I can’t imagine how she managed to achieve so much in the 17th cent. Another fascinating post. I wish that a famous moviemaker would read your blog and make a movie of her life. I would most certainly want to see it! What a character! And what tenacity! Fascinating. Love the photos and history lesson. Thank you very much – and thank you for popping into A Bit About Britain! This post is so interesting, thanks for sharing! How very different the lives these people lived. I wonder who maintains the Pillar?